Main Living Area is on the Ground Floor with Great Ocean Views! Disclosure: Pleased be advised that the tumultuous hurricane seasons in the past two years damaged our new seawall. We didn’t have time to build a new seawall before turtle nesting season. You will notice that the seawall is no longer straight and suffered some damage. The erosion in the yard has been filled in, but we still had to move the backyard fence inland about 7 or 8 feet, which is still a nice sized backyard. Most importantly the new steps to the beach were carried away by the sea. Our neighbor to the north is allowing our guests to use his steps, which is only 10-15 feet away from the backyard. This is a very spacious and OPEN beach home with windows everywhere for GREAT views of the beautiful Atlantic Ocean and beach. The Beach is great EVERY day of the year. Large Screen TV's in Living Room and ALL Flat screen TV's in all bedrooms. The entire downstairs is the main living area with a very OPEN floor plan featuring a huge Family Room, Dining Area and Kitchen; all with plenty of windows to enjoy the panoramic views of the Atlantic Ocean. Just step through the glass doors onto the deck that includes covered (for a little shade) and open to enjoy the rays. From there go down the steps and you are on the beach. What a great life! Although technically not a private beach (the PEOPLE of the state of Florida owns the beach) it feels VERY private and pristine. The entire upstairs is the huge Owner's Retreat complete with Jacuzzi tub and a private balcony to enjoy the view and ocean breezes. Imagine from your bedroom the sun rises over the Atlantic, you step out on your private balcony sipping your favorite coffee. Other than the master bedroom, everything else is on the ground floor. In other words, you don't have to climb 30 steps to get into the home. Instead you walk up zero steps into the home and only about 6 steps to be on the beach. This vacation home has everything you need for the perfect vacation; a pristine (nearly private) beach, a fully equipped kitchen, FREE HIGH SPEED WIRELESS INTERNET, Free Local and LONG DISTANCE PHONE SERVICE, board games, TV`s, DVR`s. You will find the casually furnishings are comfortable and perfect for a home of the beach to relax and spending time with family. Don't YOU deserve just a small break from all of this 'life' that we call, 'trying to make a living' and the whole 'rat race' of it all? How about some quality time relaxing with your loved ones, before life just passes you by? Think about this: You wake up to the sounds of the waves gently breaking on shore. Open your eyes and see the great Atlantic Ocean with the dolphins playing in the surf and the sail boats on the horizon. Grab your favorite cup of coffee or fresh juice, step out on the deck and just “take it all in'! After a day or two to just unwind at the beach, you may try this: Drive south for about 10 minutes you will be in historic St Augustine, 'The Oldest City in America'. Here you can tour the original 400+ year old fort, take a horse and carriage tour or check out the shops on famous St George Street. St Augustine offers restaurants from a family style on a pier to quaint gourmet restaurants. There`s plenty of family fun of sightseeing, dining, shopping and recreation. BTW, this home is open and spacious; there is plenty of room for additional guests’ beds. We have, some ‘guests’ beds' that you can use for only a small delivery fee. This home could easily sleeps 8 with 2 additional guest beds. SPECIAL NOTE FOR OUR DISABLED FRIENDS!! The ENTIRE FIRST Floor IS HANDICAP 'Friendly' NOT ADA Compliant. All the common living areas, 2 bedrooms, and a full bathroom are all on ground floor level. However, this is a 2 story unit with NO elevator! But, the good news is only the master bedroom and bathroom are on the top floor, everything else is on the ground floor. Disclosure 3: Minimum Stay Requirements: Please be sure to check if your requested dates have minimum stay requirements. If your proposed dates are on or near a national holiday OR during the peak months of June and July, the minimum stay is 7 nights with a Saturday arrival and departure. Be sure to check YOUR dates before reserving. EXCEPTION TO MINIMUM STAY RULE: If there are less days available than the minimum stay required, then the Minimum Stay Rule is NOT required. However, ALL bookings MUST be a minimum of 3 NIGHTS. I am the property manager, the owners purchased this fantastic beach house in 2005, We (Vacation Quest Beach Home Rentals) started managing Beachside Paradise May 2009. I am a native of the Jacksonville Beaches / Ponte Vedra Beaches; my family dates date to the 1600's. In my teenage years I was a lifeguard and a member of the American Red Cross Volunteer Life Saving Corp, celebrating the 100th Anniversary in 2012. My parents owned a hotel in Jacksonville Beach also in my teen years. I LOVED the hotel business. After 18 years as an executive in the seafood business, I became a Realtor, owned and managed a RE/MAX Office, then an opportunity to get back to my first love, the hospitality business this time as a manager of vacation rental homes. It is so much more fun than the traditional real estate business. 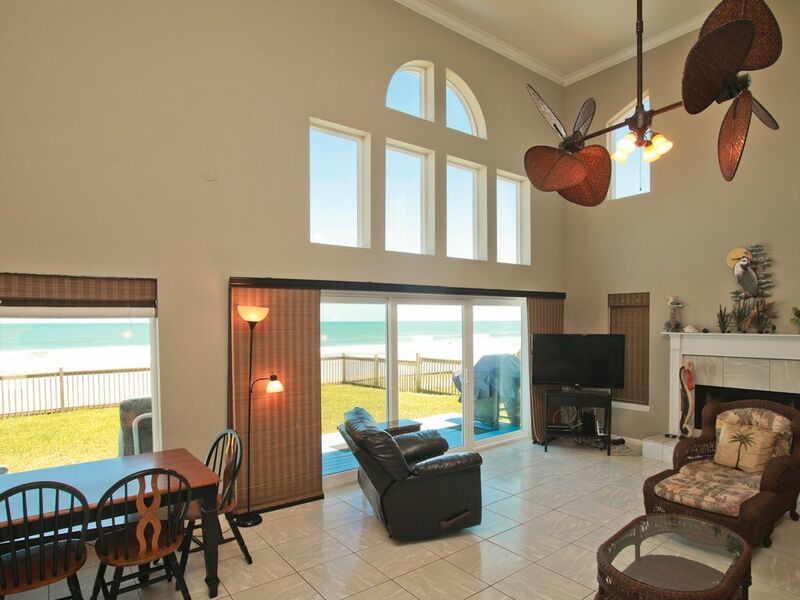 Beachside Paradise is a fantastic and fun oceanfront beach house. It is perfect for a family vacation, a couple of small families, a romantic getaway or even a couple of couples. You walk directly into the common living areas (Living / Dining / Kitchen) of the home with its high ceiling and massive windows all the way to the ceiling. Naturally the living room comes with a brand new 52 inch, 1080i flat screen TV for your entertainment. Also, on the ground floor is the 2 nd bedroom with a queen sized bed and perfect views of the Great Atlantic Ocean. From this bedroom, you have brand new sliding glass doors where you can step out onto the deck overlooking the beach. The 3rd bedroom is also on the main level, with a full bathroom between these two bedrooms. The entire upstairs is the Master bedroom complete with Jacuzzi tub (for two) a King sized bed, lots of windows with the views of the beach / ocean. You slide open the new glass doors and step onto the private balcony with two chairs and just the right sized table between the chairs. Early mornings, grab your favorite cup of coffee, step out though the doors onto the private balcony; watch the dolphins playing in the surf and 8 to 10 pelicans fly by in perfect formation. This is beach life at its best! The bathroom has a huge shower! Be forewarned, there is a shower head on both ends of the shower! It is quite a surprise when you are not expecting the rear side to get the water. Don’t say I didn't warn you! This home has everything that you need for a perfect fun vacation. This is a very unique beach house! There are very few beach homes that you do NOT have to climb up steps to get to the common living areas! This is the ONLY beach home that we manage that doesn't require many steps. If a member of your party is not very good at negotiating steps, this home is perfect. This home is NOT ADA Compliant BUT it is VERY disabled friendly. If you have for an example; a grandmother along on the trip maybe to spend some time with and watch the children; from the time she steps out of the car, she does not have to go up or down any steps. The second bedroom has a queen bed and ocean views, a full bath next door and the kid’s room is on the other side of the bathroom. Also, to get to the beach, it is only about 6 or 7 steps to the sand. ALL of our other beach homes do not have this great feature. Great price, views, deck, and the ocean all at a price you can afford! All of this at Beachside Paradise! Also, There is an outside shower is on the deck, show curtain is available in the garage, if you desire to have a shower curtain. Just look out the back door! The ocean is out the back door! Bring a book, if you finish the book, please leave it. If you don't finish a book that you found at the home, take it. All kinds of different beach toys come and go. Please do not take toys found at the home. Thank YOU. This home has a front yard and the back yard is fenced. Great for kids and pets. NOTE: Please pick up after your pet. That is NOT housekeeping's job! The balcony is huge, located off the Owner's Suite, 2 chairs and a small table, perfect for views and coffee in the AM and the drinks are up to you in the afternoon/evening. For Rent and / or GREAT Guided Tours via Kayak! NOT a free at the home amenity Lots of fun! Wood deck runs the length of the home. Availbale at Sawgrass Club with a temp. membership. Availbale at Sawgrass Club with a temp. membership. See you YOU can hit the green on the very famous 17th Island Green, even the pros seem to have a problem with THAT Green! Jacuzzi Tub located in the Owner's Bedroom. Room for 2 Adults and ocean views too! Lots of history in the United States OLDEST City and lots to do in either direction. NOT ADA compliant, BUT, very disabled friendly, please call office and ask for Daryl to explain in detail. We hope to be back soon!!! This lovely beach house was just the ticket to escape the winter cold. We are VERY pleased that you enjoyed your stay at Beachside Paradise! We all here at Vacation Quest in Ponte Vedra Beach, look forward to you staying in one of our beach homes again!! Lovely home and very clean. Enjoyed our stay. Only downside is living room furniture is very uncomfortable. Absolutely beautiful house with amazing ocean views from every window! It was even better than we had hoped. The ocean is literally in your backyard. We will definately stay again. The house and property were amazing. The view from the living room to the ocean is great. The house had everything we needed even beach chairs and toys. The fenced back yard was great and the kids loved running and playing back there. My little girl loves trying to catch lizards off the fence. Short and well kept steps to the beach. All in all a great house, great beach, great time with family and friends. Can't wait to get back! My family plus in-laws had a great time at this property! We all here at Vacation Quest are looking forward to seeing you back again! If you drive south for about 10 minutes you will be in historic St Augustine, 'The Oldest City in America'. Here you can tour the original 400+ year old fort, take a horse and carriage tour or check out the shops on famous St George Street. St Augustine offers restaurants from a family style on a pier to quaint gourmet restaurants. There's plenty of family fun of sightseeing, dining, shopping and recreation. If you drive north about 10 minutes you will find the upscale, Ponte Vedra; the home of PGA's TPC, 'Tournament Players Championship', where you can see IF you can hit the green or land in the water on the most famous 17th 'Island' green. Here you will find world class golf, tennis and some of the finest restaurants in the country, including 'Ruth's Chris'. The MONTH Price is based on 28 Nights (4 Weeks) Home Away shows 30 Nights. We often have specials. Discounts are taken off the RENT ONLY - NOT Fees & Taxes. When discounts are available, you must book a MINIMUM of 5 Nights to get the discount!! NOTE: Specials or Deals are NEVER Retroactive Prices are subject to change WITHOUT Notice!